“Slave to the Empire” is a throwback to the 1980s when Rock was this unpretentious music full of youthful high-octane energy. And man, it feels sooooo good to be there again! T&N (that’s Tooth & Nail abridged to T&N for copyright reasons) was created by Jeff Pilson (bass), George Lynch (guitar) and ‘Wild’ Mick Brown (drums) – in essence this is Dokken minus Don Dokken. (“Tooth & Nail” was in fact the title of Dokken’s 2nd album, released in 1984.) With the Dokken dudes are a range of guests who drop by to pay their respects: Tim “Ripper” Owens (Yngwie Malmsteen, Judas Priest, Iced Earth), Doug Pinnick (King’s X), Sebastian Bach (Skid Row) and Robert Mason (Warrant). 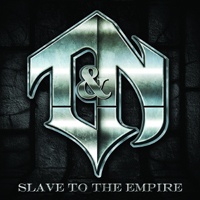 “Slave to the Empire” – the band’s debut – features 5 re-recorded Dokken classics in addition to 7 new songs. It’s a strange format, to be honest. But you know, who cares about the whys and what not's! Of far greater relevance is that the songs are a bundle of sharply executed, Bluesy, infectious Hard Rock energy. Jeff Pilson is adequate at lead vocal duties and Brian Tichy (Whitesnake, Foreigner), who plays drums in the new compositions, is his usual manic self. So go get this album!